Constellation Crux the Southern Cross, is a southern constellation laying south of conetalltion Centaurus. 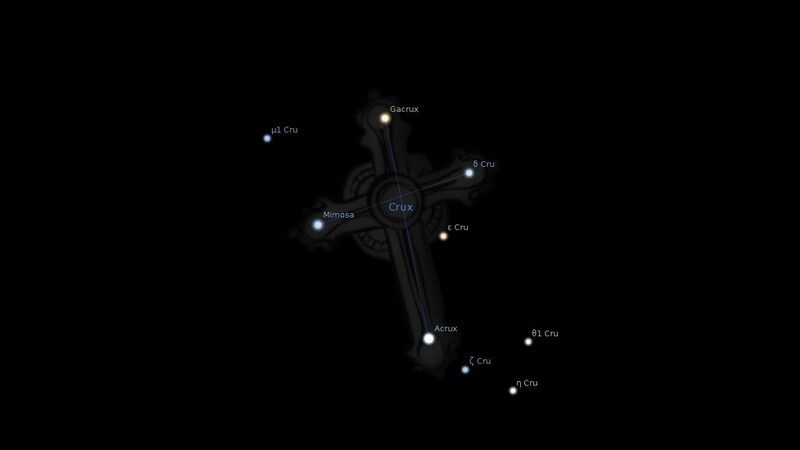 Crux spans only 13 degrees of the zodiac in the sign of Scorpio, and contains 5 named fixed stars. The Hebrew name was Adom, which means cutting off, as in Daniel 9:26 “After threescore and two weeks shall Messiah be cut off.” The last letter of the Hebrew alphabet was called Tau, which was anciently made in the form of a cross. This letter is called Tau, and means a mark; especially a boundary mark, a limit or finish. And it is the last letter, which finishes the Hebrew alphabet to this day. It is a small asterism, containing only about five stars, viz., one of the 1st magnitude, two of the 2nd, one of the 3rd, and one of the 4th. Four of these are in the form of a cross. In Egypt, and in the earliest times, it was the sign and symbol of life. Today, Romanists use it as the symbol of death! But it means life! Natural life given up, and eternal life procured. Atonement, finished, perfect, and complete; never to be repeated, or added to. All who partake of its benefits in Christ now, in grace, by faith “ARE made nigh by the blood of Christ” (Eph 2:13), and of them Jesus says, “He that heareth my voice, and believeth on Him that sent me HATH everlasting life, and shall not come into judgment; but IS PASSED from death unto life” (John 5:24). So perfect and complete is the work which Jesus finished on the Cross that we cannot seek to add even our repentance, faith, tears, or prayers, without practically asserting that the work of Christ is not finished, and is not sufficient! The Hebrew names of this constellation–Adom and Tau–rebuke our Pharisaic spirit, which is the relic and essence of all false religions, and points to the blessed fact that the Sacrifice was offered “once for all,” and the atoning work of Redemption completely finished on Calvary. 2. Crux: the Southern Cross, Deborah Houlding. 3. Star Names: Their Lore and Meaning, Richard H. Allen, 1889, p.184-191. 4. The Witness of the Stars, E. W. Bullinger, 6. Crux (the Cross). i have this constellation on my face in the form of freckles. These are the only freckles i have on my face. Wow, this is amazing. I have often wondered about this as well as scars being related to our charts but never constellations.